As I climbed into my stand around 6:00 am on November, 17, 2012 I couldn’t help but think that this was my 46th consecutive opening day of hunting the whitetail firearms season. I also couldn’t help but think that this was the earliest that I had ever settled into a tree stand. I knew that my sons, Joe and Tom, were also settling in at about the same time. Over the past 8 to10 years they have been coaching me to let smaller bucks go and wait for a big one. During that time I had stopped shooting yearling bucks and was coming home with bigger and better bucks. Nothing really big, though. My sons had asked me what it would take for me to get a buck mounted. I had made up my mind that a buck would have to be 140+ inches to get it mounted. I knew in the back of my mind that was nearly impossible, so it was nothing to waste too much time thinking about. As I sat there I couldn’t help but think about how quickly time passes by. The day before I turned 61, which is just a number, but nevertheless it is a pretty big number... It seemed like just yesterday when the numbers were turned around and I was a 16 year old heading out for the first time. I also couldn’t help but think that on November 17, 2009, three years earlier, my mother had passed away. In her memory I had dug out a hat that she had knitted a couple of years before her passing. I washed it with my other clothes and was ready to go. The hat was little big, but it felt just fine. I was hoping that it might bring me a little luck. A little after 6:30 am the sky began to brighten. My stand is next to a swamp and I could see that the water level had risen and was nearly under my stand. I also could see that there was a coating of ice on the swamp. Neither of these observations were a plus. I decided to stay where I was and hope for the best. The wind was light and from the southeast which was good. The temperature was in the low 20’s and seemed even colder with my stand over the frozen water. It’s incredible how cold it gets as the sun begins to rise. Everything was quiet until 8:30 when I caught some movement. It turned out that there was a group of eight does and fawns heading towards me along the edge of the swamp. As they filed past I could see another deer lagging behind. My anticipation jumped when I caught a flash of antlers. The excitement diminished when I got a clear look and saw that it was a yearling 5-point. I watched him pass and he disappeared into the brush.The sun finally got high enough to provide some warmth around 9:00 and by 9:30 I started to feel quite tired. I hadn’t seen any other deer so I decided that at 10:00 I would get out of the stand and take a nap. As I started to climb down at 10:00 I noticed movement behind my stand that turned out to be a group of deer. They were deep in the brush and I could only see some occasional movement. At 10:15 I could see deer again and they were coming my way. There weren’t any antlered deer and they ended up stopping about 40 yards behind my stand. I eased back into my stand and was enjoying the show when I heard footsteps breaking the ice off to my left. As I turned my head I saw a very nice high racked 6-point coming in to join the group. He seemed quite interested in one of the does and began to follow her around. I was watching the show when one of the other does began staring at something behind me and started to lightly stamp her foot. I slowly turned to my right and caught a glimpse of a large antlered buck going into the brush. I looked ahead of him and saw an opportunity for a shot about 15 yards ahead of him where the brush was thinner. When I reached for my gun the sling got hung up on the hanger. It took a couple of seconds to free the gun and at that time the buck was nearing the only spot where I had a chance for a shot. I shouldered my gun pushed the safety ahead and found the buck’s shoulder in the scope just in time. I was able to swing with him for a couple of feet and pulled the trigger. He collapsed with the shot. He was able to get his front legs under him and as I prepared to shoot again he rolled away from me onto his side. He kicked a couple of times and was still. I slowly sank to my seat and felt an extreme feeling of calm and contentment. I sat there a few minutes trying to come to terms with what had just happened. The buck laid 45 yards away and I had never gotten a good look at the antlers. What I had seen could not be true. 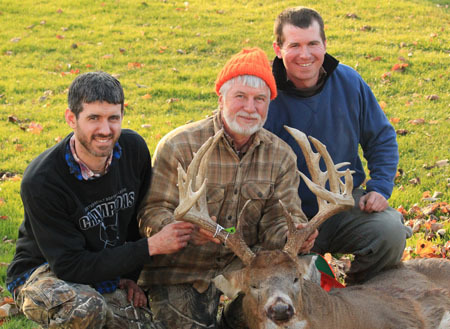 I called my son Joe and told him that I had just shot a decent buck. I told him I would call back when I got a better look. As I approached the buck his left antler kept looking bigger instead of smaller. Through my life I had gotten used to ground shrinkage as being a normal occurrence. I only could hope that there was a right antler that matched. I lifted his head and was witnessing a thing of beauty. I counted 18 points that were over an inch and his abnormal points matched side to side. After talking with my sons they couldn’t wait to come and see the buck. I told them I felt that it should score at least 140. It turned out that I didn’t have much to worry about. It was a very special moment when I saw their faces as they first saw the buck. Joe took a few pictures with his iPhone and sent them to a few friends. From what I’ve heard, the photo got around quite fast. We sat for some time with the buck before we took him out of the woods. It is time that I will never forget. The next day was busy with a lot of local hunters dropping by to see the buck. Later that day we took the head and cape to Bob Estes’ home in Caledonia. 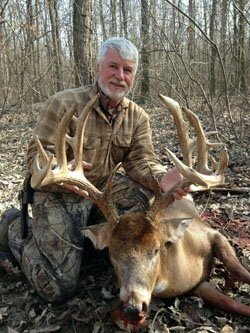 He green scored the buck at over 195 inches. After the 60 day drying period the gross score was 195 5/8 and the net was 188 6/8. The buck was aged at 5 ½ years and dressed at 185 lbs. Rod Zulauf, a local taxidermist, did an excellent job with the mount. It now hangs prominently in our home and constantly reminds me that dreams can come true.